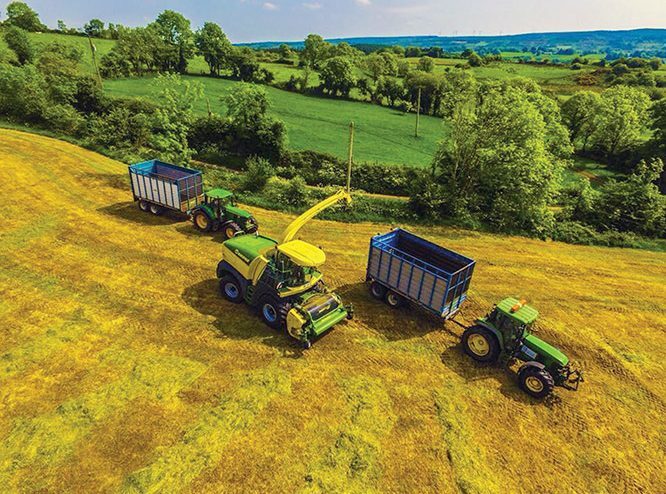 Given the expensive nature of farming machinery many farmers turn to contractors to carry out their annual harvesting and other work that is carried out every year. Since the age of 14, Pat Mulchrone has been working in the agricultural contracting business, when he first left school and with a finger bar mower, he started providing a service to many of his neighours. Almost 40 years later and Pat is still providing services to a customer base that has grown considerably over the years, although he has moved on from the finger bar mower to much more modern machinery. So to say that Mayo based Pat has picked up great experience over the years would be a massive understatement as he has seen it all and done it all. However, to be fair that is not exactly true as even he admits to Irish Tractor that he has never seen the likes of the weather conditions that hit the country during June and July. A heatwave hit the country and although many basked in the sunshine, the farming community was met with massive concerns over a lack of rain which brought about its own problems. “I’ve never witnessed anything like it. We still haven’t got to finish the first cut. From having artic like conditions only a few months ago to the heatwave was extreme to say the least,” said Pat. They have a wide range of machinery to carry out your work quickly and efficiently, providing you with value for money and an alternative to investing in your own expensive equipment with almost 40 years’ experience in Agricultural Contracting. Pat operates a fleet of five John Deere tractors, 6800, 6910, 2 x 6820 and a 6830, while a Claas 650 mower does the mowing. “I would buy good clean second hand machinery with low hours on them. The price of machinery has gone up a lot. We would be putting anywhere between 1,000 and 1,500 hours on the tractors every year, so it is important to keep them well maintained. Slurry work is big part of the work provided by Pat and his team and the umbilical system is his preferred choice for spreading. Many contractors operate within a ten or 20 mile radius of their bases, but for Mulchrone Agri they travel much further to provide their services. Two McConnell hedge cutters keep the hedges of west Mayo nice and trim during the winter months, while sludge work for the local authority is also carried out. “We have our own waste permit for the sludge work, while the hedge cutting keeps us going over the winter months. Farm machinery is a rough and tough game to be in when rules, regulations, insurance and health & safety are taken into account. There is a lot more management involved than 20 years ago. It’s not something anyone can pick up. You have to be around it all your life,” the affable farm contractor stresses. Of course to do all this, Health & Safety is paramount and all the necessary permits are needed and kept up to date. Agricultural contractors provide an important service to farmers, particularly at these busy times of the year. Many of the services provided to farmers by contractors, such as slurry spreading, harvesting silage, also involve serious safety risks if they are not correctly planned and managed. Drivers have been with the team for many years and thankfully, there have been no major incidents.